In the early 1980’s natural pet food was a revolutionary concept. Seen by many as merely a means to an end, pet food was not given much thought by the majority of pet owners. Unfortunately, most commercially available pet foods at the time were full of chemicals, preservatives and synthetic additives. Dr. Harvey Cohen, a nutritionist by trade, recognized the detrimental effects that these diets were having on our pets and decided to do something about it. Over 30 years later, Dr. Harvey’s continues to lead the way in the natural pet food space. 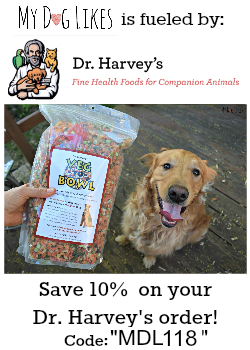 Whether you are just beginning your journey into all natural dog foods, or have been preparing your dog’s food for years, Dr. Harvey’s makes it easy to assure your dog is getting exactly what he/she needs. From nutritional supplements, meal add-ons and complete balanced diets, Dr. Harvey’s has an option that will fit perfectly into your lifestyle and level of comfort. Simply put, they make feeding healthy, homemade meals accessible to the average pet parent. Dr. Harvey’s was kind enough to send us a sampling of their food and supplement lines to try and share with our readers! Dr. Harvey’s all natural supplements are designed to optimize the health of our best friends. What makes them truly unique is that they contain no synthetic ingredients. Instead, the vitamins and minerals are all derived from natural foods and prepared in a base of bee pollen, spirulina, lecithin and other herbs. Whole food supplements like these are easily absorbed by the body and therefore will maximize the benefits of the various ingredients. This differs from the more commonly used synthetic vitamins and minerals which can put a strain on the dog’s body and are often poorly absorbed. We tested out the Whole Food Herbal Multi-Vitamin and Mineral – an everyday powder supplement that makes a great addition to any diet. 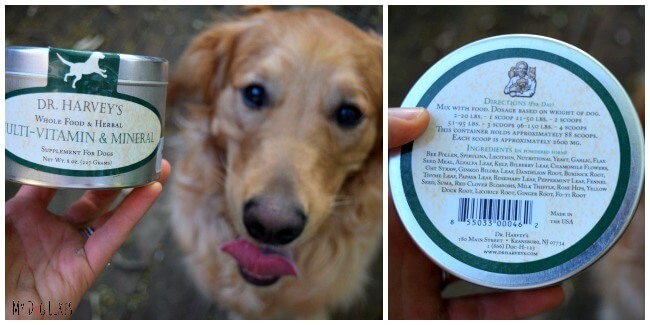 Just sprinkle on your dog’s food and you are good to go! With Dr. Harvey’s there is no arguing with the pups about taking their vitamins! The boys gobbled this supplement right up “as-is” but went into full out food frenzy when we added a little bit of water to make a paste. Try as I might, I cannot figure out the smell that it is releasing, but I will tell you this…it smells good! 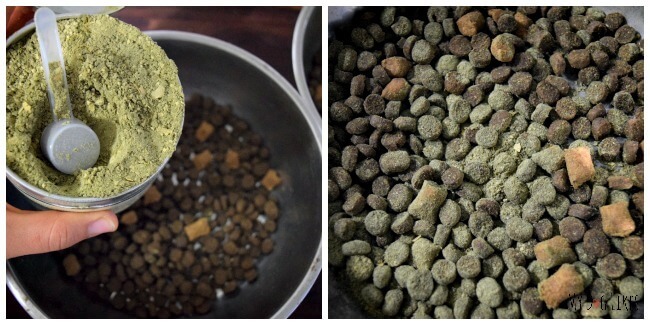 A few scoops of powder on their grain-free kibble is all that is needed to provide the boys with the benefits of vitamins without all of the fillers or junk that is commonly found in them! Want to know more about the wholesome ingredients found in Dr. Harvey’s supplements? Go no further than the back of the tin where you will find a complete list of ingredients, talk about transparency! Wondering how much your dog needs? Dr. Harvey’s provides a simple dietary guide on the back of the container (and a little scoop) taking away all of the guess work. The container we received contains approximately 88 scoops, which for big dogs like ours which equates to a 1 month supply! If you have a smaller dog, these supplements will really stretch and give you a great bang for your buck! Perhaps you want to get started preparing your dog’s food but are concerned about providing a balanced diet? Dr. Harvey’s can ease your mind with their Veg-to-Bowl pre-mix. This blend of 100% natural, dehydrated vegetables, vitamins and minerals makes a great addition to any homemade dog food diet. 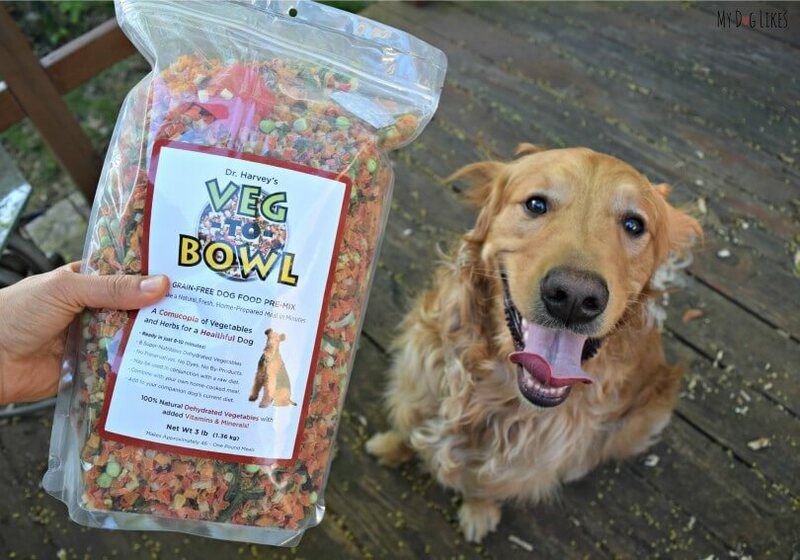 Veg-to-Bowl is grain free, and pairs very well with a raw diet or as a vegetable add-in to your dogs current food! To prepare, simply add hot water and let soak for 8-10 minutes. We are busy, busy during the week so we followed Dr. Harvey’s advice to make some Veg-To-Bowl in advance and store it in the refrigerator. When dinner time came, everything was ready to go and so convenient! Dr. Harvey’s suggests a few different options for feeding Veg-To-Bowl. 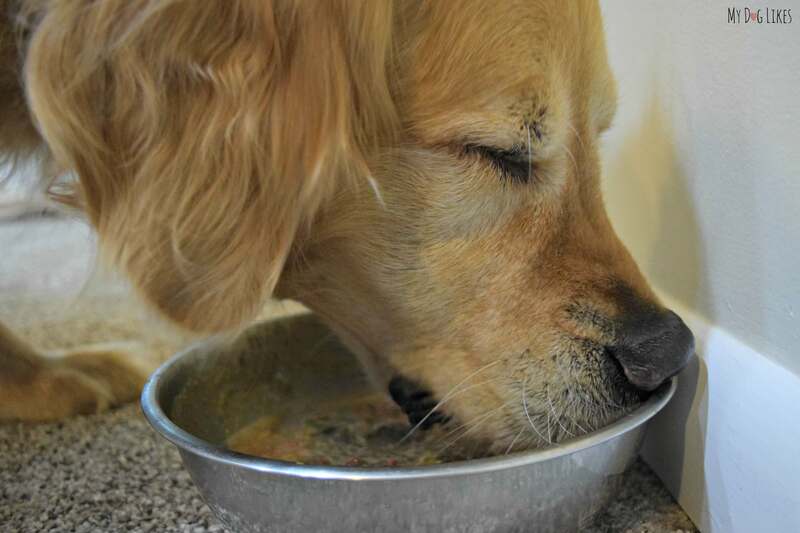 If your dog is already eating raw, follow their easy to use feeding guide and jump right in. Simply add a lean, high quality, protein of your choice and some healthy oils to your Veg-To-Bowl and you have a complete and balanced meal! 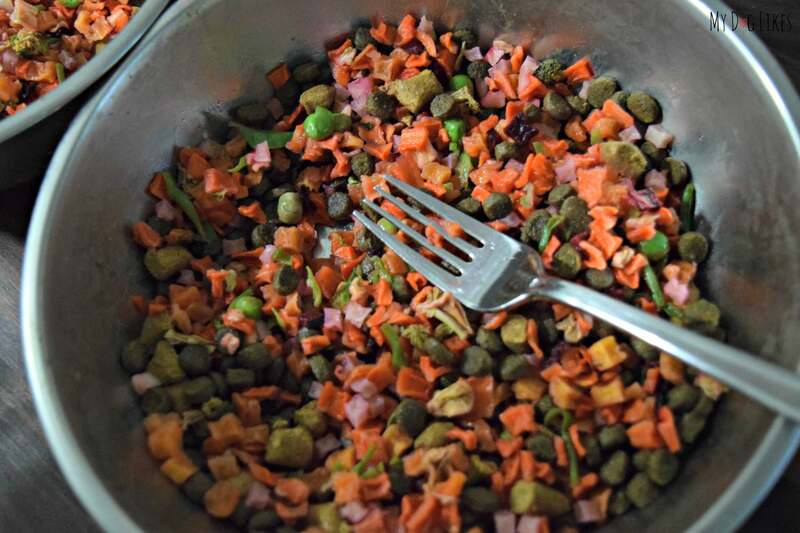 Though most dogs tolerate Veg-To-Bowl very well, if you are at all uncertain, Dr. Harvey’s suggests making a slow transition (over a week) gradually reducing kibble and increasing raw! 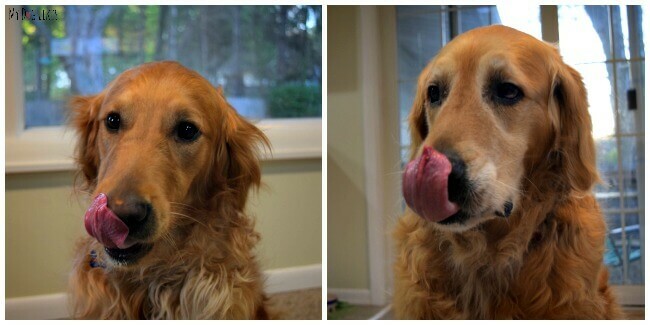 Feeling unsure of how much to feed your dog? 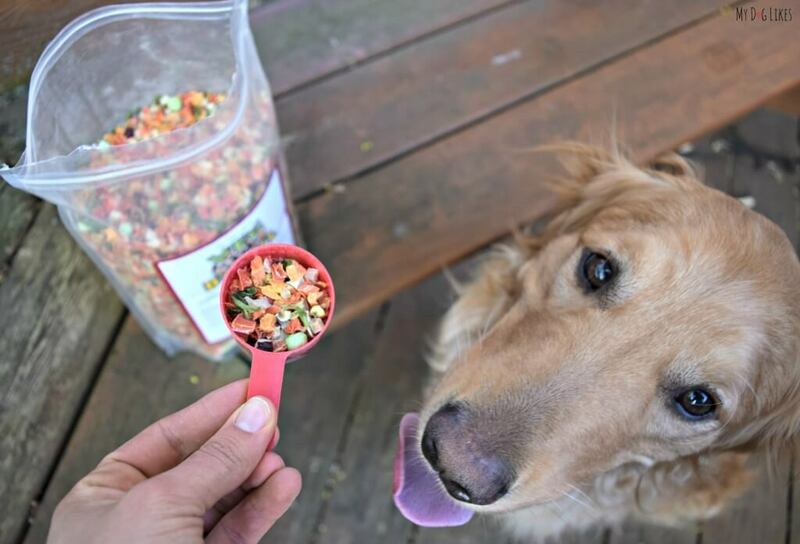 Dr. Harvey’s wants your pups to be healthy and includes great tips for proper feeding and includes a handy scoop in each bag! Eating veggies is a common occurrence in the MyDogLikes household. Whether leftovers from our lunch prep, a purposeful snack, or the casualties that fall on the floor; the boys love the extra crunch! 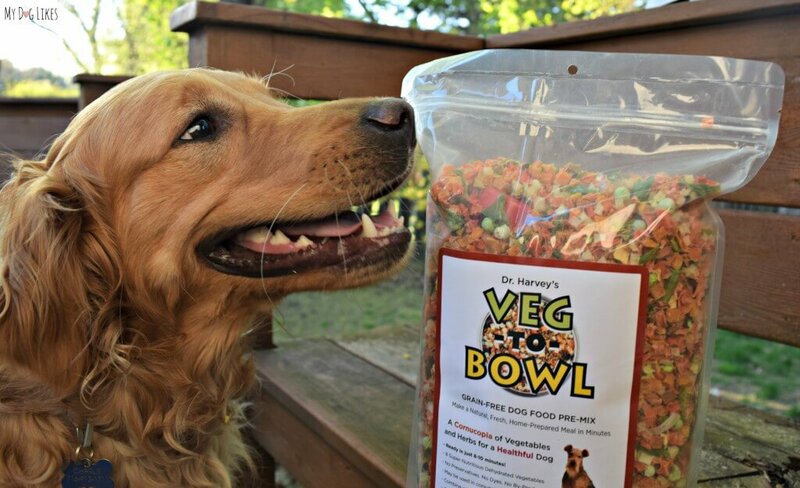 If you currently feed a high protein and high quality kibble, Dr. Harvey’s Veg-To-Bowl, may just be the perfect supplement to your dog’s diet. As our vet explained to us, the boys need very little (quantity wise) of their current kibble to meet daily nutritional needs. Very often, that does not physically fill their bellies, leaving them feeling hungry physically, despite the fact that they are nutritionally full. 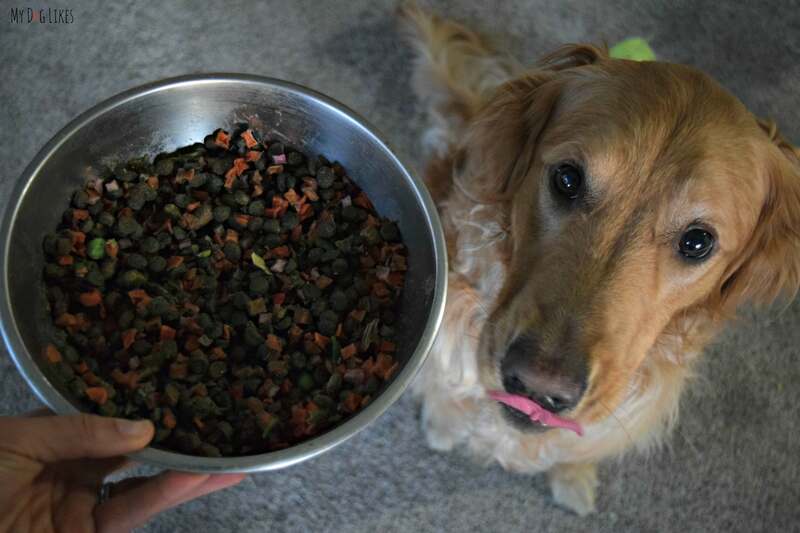 She shared that because veggies are a low calorie but high fiber food, adding them to the boy’s current grain-free kibble would help them feel full after a meal. Did it work? Sure did! Other than the initial licks on the bowl right after meal time, the boys stopped heading back in to their bowls and licking hours later. The boys loved the veggies and took their time savoring all of the natural goodness. In the days immediately following feeding the Veg-To-Bowl we noticed another unintended consequence, more pooping! I know this probably sounds like a bad thing, but it made me think that the increase in fiber was leading to better digestion, almost like a cleanse! Fear not, after a few days the boys were right back to normal! 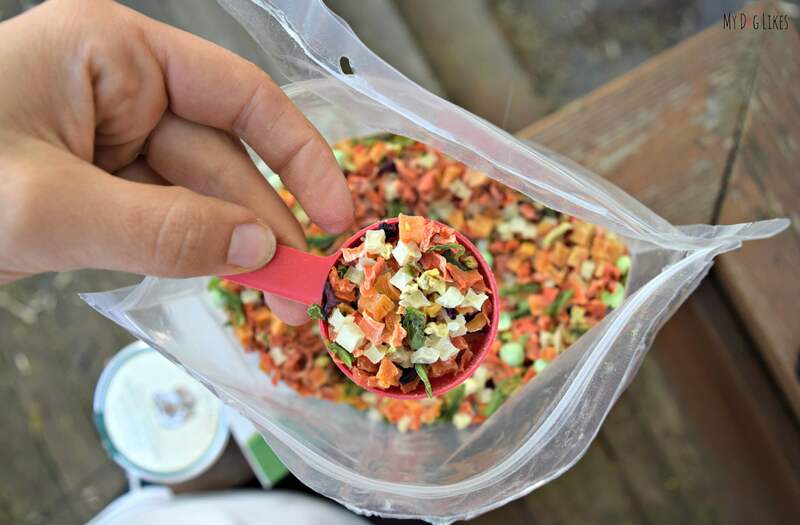 Perfect for those who would love to feed raw, but can’t imagine the daily meal prep involved! 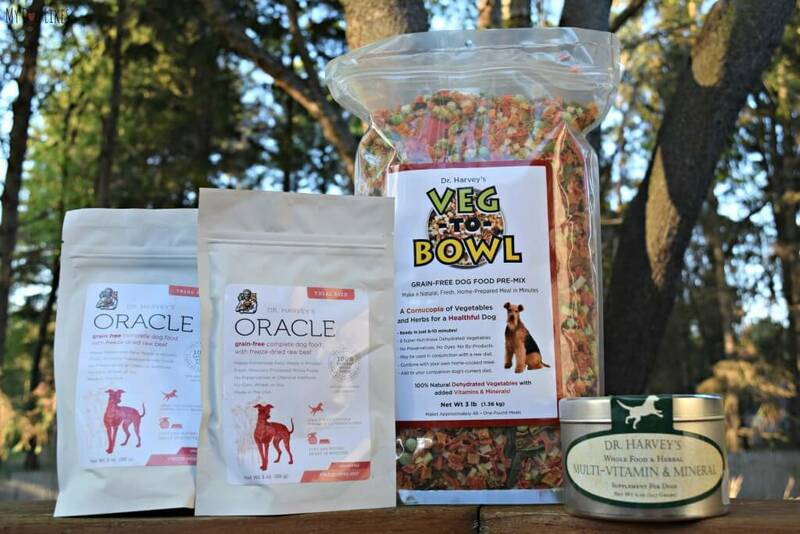 Oracle is a complete raw dog food with protein included. 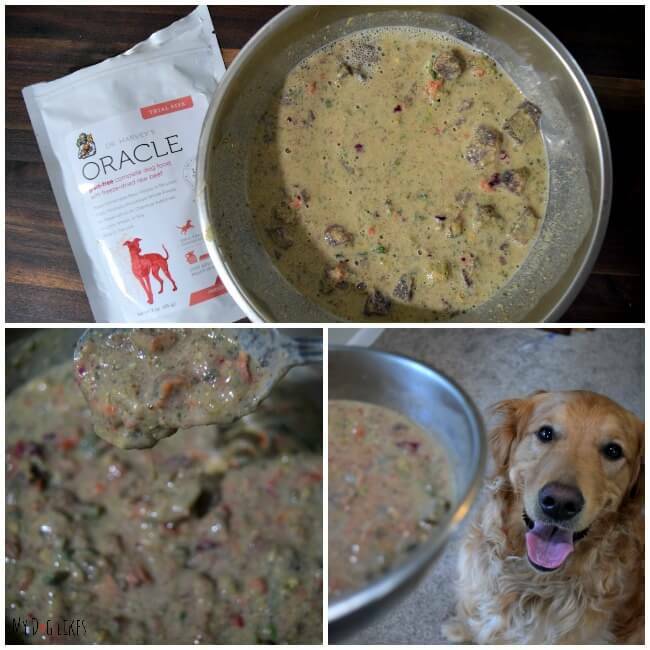 Available in freeze dried beef, chicken, tripe or grain-free formulas, Oracle represents the easiest way to feed the Raw Diet of you (and your dog’s) dreams. Their no-nonsense ingredients are truly top notch. In fact, the ingredients read more like the shopping list at a local farmer’s market, rather than an all in one meal for dogs! Just take a quick look, does anything seem out of place to you?! Preparation couldn’t be easier and (according to the pups) lead to a tastier result! Simply add warm water and let it sit, waiting approximately 10 minutes to soften everything up and serve to your pup. Just like the Veg-To-Bowl, Oracle can be made in advance and stored in the refrigerator for up to three days. Though it looks a little soupy in first photo, over time it thickens to the consistency of a stew as you can see in another photo. To say that the boys loved Oracle would not do it justice. The boys kept looking at me while eating, secretly wondering if they were really supposed to be eating this delicacy. They slowly slurped and lapped up any liquid before going after the larger chunks. Meal time lasted for nearly 5 minutes as they took their time eating up the whole bowl of yum and licking up every last drop of gravy. Oracle is head and shoulders the easiest and most convenient formula we have used. As we have talked about before, that convenience (and quality) also comes with a price tag. Though the boys loved Oracle and I would LOVE to feed it to them for every meal, we would quickly run through our monthly food budget with these big guys. We do think this food would be a great option however for smaller dogs! UPDATE: Oracle is now available for 25% less! As a pioneer in the healthy pet food space, Dr. Harvey’s puts the health and well-being of our pets first and foremost. Their commitment to providing pets the absolute highest quality nutrition is inspiring. It is safe to say that they are changing the way pet parents look at food and the effect that it has on both quality and quantity of life. The impact they have made in improving the health of our beloved pets is further solidified through the countless testimonials available on their website. 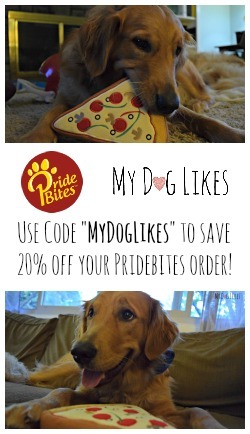 MyDogLikes readers SAVE 10% with our Dr. Harvey’s coupon below! These foods look pawsome! I love holistic pet foods. I like that the supplements don’t have any synthetic ingredients. Natural ingredients are so important! We couldn’t agree more and are so happy to have found out about Dr. Harvey’s! I’ve been going back and forth on whether or not to try the Oracle grain free chicken (my dog can’t have beef), so I think that would be best for my little gal. I don’t know about the Veg to bowl. I don’t think that I’m ready to be adding my own protein. My only concern with the Oracle is the protein. It’s difficult for me to see, but it looks like the meat is in large chunks, rather than evenly distributed throughout the product. She’s a small dog (under 10 lbs) that has to have a carefully monitored diet to keep her weight under control, and I’m a little worried that she might not get enough protein in each meal. She also just had a 2nd (in 12 months) surgery on her knees, so she needs optimum nutrition daily. You’ve tried the Oracle, so I was hoping that you might be able to add a little insight? Sarah is 10, so we would also love to try the Golden Years supplement. Great questions. In the photo you can see that I am pinching a piece of meat. They are larger chunks in the Oracle. The trial sized bags pictured are what is needed to feed a 10-15lb dog. I know it seems a little scary, but perhaps the Veg to Bowl would be a better option because you could control exactly how much protein she is getting. I think something like ground chicken (cooked or uncooked depending on your comfort level) could be a great option to add. I hope this answered your questions. Feel free to email or respond back and I can answer anything else you might be wondering! I think the Canine Health-The Miracle Dog Food would be perfect for us and our furry babies. Getting our paws on Dr. Harvey’s line of premium, healthy dog food was the best thing that could have happened to us this year! I had been thinking about transitioning our pups from their high-quality kibble & wet food to a homemade, possibly even raw, diet, for quite some time now. 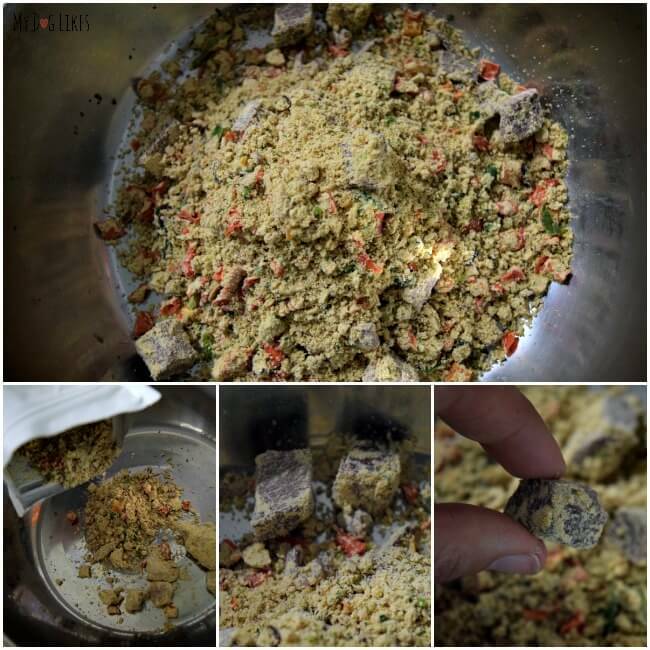 To be honest, I was overwhelmed with the idea of making our dogs’ food from scratch, fearing I wouldn’t be able to keep their nutrition balanced. We have been using the Veg-to-Bowl pre-mix for almost 2 months now, and have happily been experimenting with various protein sources. It has been a fun, educational journey for our entire pack, and the pups love their new food! You do have a point regarding the overall price tag of homemade dog food, however. I quickly realized that I would need to shop around for value priced meat in order to keep feeding a high-quality meat not containing added growth hormones & antibiotics, and also add lentils & eggs to our protein equation. Barbara, Great points. I am SO glad you found Dr. Harvey’s too! I think its so nice to be able to take some of the worry out of preparation and the Veg To Bowl is such a great option for bigger dogs. Its interesting because we have always avoided chicken and beef and I realize that as their diet improves they handle chicken and beef just fine, it must have been the “other” stuff, even after putting them on high quality, grain-free kibble. My next journey is to use the Veg-To-Bowl and source my meat. I think that buying left overs from the farmer I use for our meat (organic/free range) might be a good option. Keep us posted on your progress! The veg to bowl. I feed a mostly homemade PMR diet, but do regularly use premade and dehydrated raw. I like the idea of the veg to bowl. I think they’d like most, though. I’d love to try … I mean, Jake would love to try … this food. He says he’s like to try any flavor. The Oracle sounds interesting. The Veg to Bowl fine ground sound great, the entire line us amazing. I worry about our pup getting enough veggies so this is perfect, and since he’s a miniature dachshund / chihuahua mix I’d opt for the fine ground. Sounds like it would be an excellent choice for your baby! Congrats I bet he is loving life with you! I think the Veg to Bowl would be best for my furbaby because she needs to lose weight. I think Veg to Bowl sounds wonderful for my terrier. I like the idea of both the Oracle and Veg to Bowl types. I currently have four Treeing Walker Coonhounds – down from five as my sweet deaf hound girl, Ran, passed a couple of weeks ago from an autoimmune disorder. Of the four there’s one senior, one overweight, and two who are around 5 years old. I’m hoping to adopt another dog in a couple of months – figuring on either a puppy or young adult. I’ve been feeling grain-free for a while now and these sound wonderful. Linda, first of all, I am so sorry to hear about Ran 🙁 I know how much you love and how well you care for your dogs. She will be greatly missed! I think Dr. Harvey’s would be a great option for your crew. We were so impressed with the quality of ingredients and our boys absolutely loved it! Boy, it all looks good. Ted would probably like the gravy. The Veg-to-Bowl would be perfect because my dog eat raw! The Veg-to-Bowl would be be great for my jack russell. She got her first taste of raw today and loved it and this would be a great way to make sure her diet is balanced. Oracle would also be great for those days when in a rush or for traveling. We agree! It makes life a lot easier “on the go”. Since I already feed raw without the veg/grains, I think just the multivitamin supplement would work for us. I think Mike might benefit from the Canine Health-The Miracle Dog Food combination, and I would like to try this method of feeding him. He loves gravy! We didn’t try that one, but the testimonials are unanimous! We are ginormous fans of everything Dr. Harvey’s! We are currently using the Veg-to-Bowl and the Barkotti treats are incredible. We couldn’t agree more Melissa! We are life long fans now! We haven’t tried the treats yet, but he boys love the Veg to Bowl! Wow. Their stuff sounds amazing! I would love to try the Ortho-Flex Supplement for one of my girls, she’s had hip leg pain since before we got her and age has a way of making things worse. It would be great to find a holistic way to help ease her pain on the days when it acts up for her. I think we are going to try the same for Harley! Good luck to you and your girl! I think oracle would best fit our lifestyle for our pups!!! My pug baby would love the Veg-to-Bowl. Our golden would love this! i would like to try out the Oracle! Would love to try the veg to bowl if it helps them lose a little weight! It all sounds great! I think the veg-to-bowl would be the best option for my mom’s puppy, Mr. Beezly!!! He needs to stay lean and healthy! I would love to try this with my 2 picky rescues. Forgot to add which one. The canine health miracle dog food. Debbie the testimonials are amazing. I wish I could give a bag to every single one of our readers! I would like to try both the Oracle and Veg-to-Bowl. I’ve never heard of anything like Veg-to-Bowl, and I have a strong feeling my pups would absolutely adore it! Probably a lot of them, he loves food. There are lots of interesting ones. Excellent review, we love Dr. Harvey’s products! we wanna try veg to bowl! I think the Veg to Bowl would be a good one to try on my dog. I think I’d want to try Oracle. Thanks! I think I like the Canine Health-The Miracle Dog Food best. Lots of great options! I think Veg-To-Bowl Fine Ground would be the best fit. It all looks really good, but I especially like the veg to bowl option. The Canine Health-The Miracle Dog Food would be my choice — think the dogs would really like this. I think they would too! Oracle would be my choice for my boy. Canine Health would work well for my rescued dogs. Canine health miracle would be awesome! 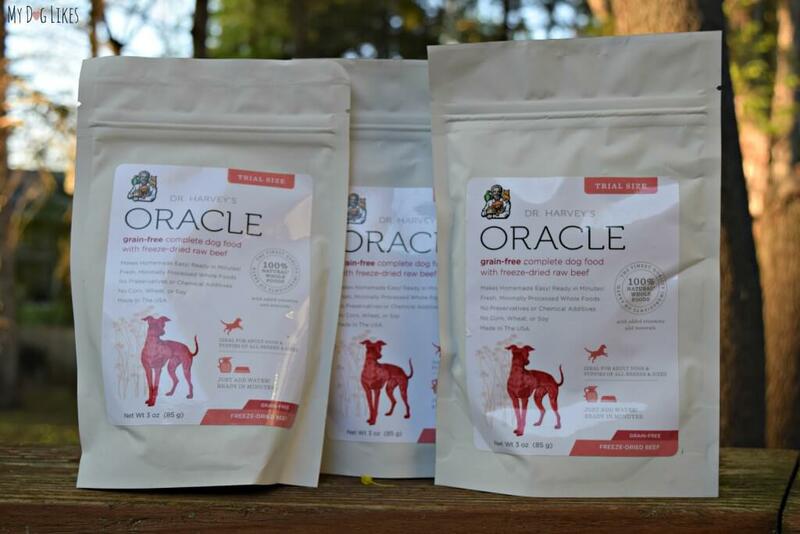 I think my girls would like the Oracle Dog Food. Thank you! Oracle- I like the just add water option. I would like to try the veg to bowl (great play on the name) for my 7 month old pup Tuc. After reading the testimonials, its hard to imagine a dog that wouldnt love it! We are doing research on raw feeding and seeing it would fit into our budget. The veg to bowl sounds like it would be a great addition whether we end up switching to raw or not! For us, its been about finding the right balance. We love Raw Infused food supplemented with Veg-to-bowl and other freeze dried or frozen options because we have big dogs! My pups thrive on a grain-free diet. The Veg-to-Bowl looks like the perfect food option for them. We couldn’t agree more! The longer the boys are grain free, the greater the results are! I think Oracle from Dr. Harvey’s would be good for our dog. It would be good for our dog. I’m a huge Dr. Harvey’s fan! This food has brought my babies back to health. One question though, I still don’t feed completely raw because it makes me nervous (silly human) I was wondering if I could use 16 ounces of ground turkey and the appropriate amount of miracle base mix and make meatloaves for the fur babies? Any advice would be greatly appreciated. My 11 year old Miniature Pinscher, Ty, was recently diagnosed with early stage kidney disease. He also has Cushing’s disease. He has been taking meds for about five years for the Cushing’s. Our vet recommended Hills Prescription K/D dog food. It’s a specially formulated renal diet. She was very adamant about not feeding anything but the K/D food. Ty hates it and for the past two weeks has refused to eat the food. If you know anything about Min Pins, they rarely ever refuse food. After doing some research online, I purchased some of Dr. Harvey’s Canine Health food. This morning I gave it to Ty. My husband and I watched him get excited about eating again. He ate a very generous portion, in which I added ground turkey and fish oil. I got on the internet searching for any bad review of Dr Harvey’s food. Happily, I can say that so far, I haven’t found any bad reviews. I am just so happy to found this website. Kathryn, I am so glad that you came upon Dr. Harvey’s and that Ty is excited about eating again! Thank you so much for stopping by and sharing your story and please keep us posted about how he is adjusting.